Here is the official press release with all the information. 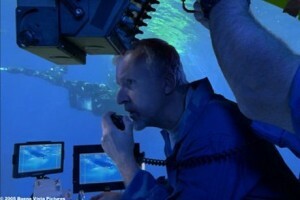 Filmmaker and National Geographic Explorer-in-Residence James Cameron announced today that he will attempt to reach the world’s deepest point, the Mariana Trench, nearly 7 miles (11.2 km) beneath the ocean’s surface, in the coming weeks. Cameron’s dive in his specially designed submersible marks the launch of DEEPSEA CHALLENGE, a joint scientific project by Cameron, the National Geographic Society and Rolex to conduct deep-ocean research and exploration to expand our knowledge and understanding of these largely unknown parts of the planet. Relying on advanced engineering and technologies created by Cameron and his team, successful field tests were completed this week off the coast of Papua New Guinea. They included untethered deep-water dives — including one to a depth of more than 5 miles (more than 8 km) — in the revolutionary, single-pilot DEEPSEA CHALLENGER submersible, the result of an eight-year engineering effort and the deepest-diving manned marine vehicle in existence. The public will be able to follow Cameron’s progress on the expedition at www.DEEPSEACHALLENGE.com; on Twitter by following @DeepChallenge or using #deepseachallenge; or on Facebook at https://www.facebook.com/deepseachallenge. The Challenger Deep has only been reached once in a manned descent, on Jan. 23, 1960, by U.S. Navy Lt. Don Walsh and Swiss oceanographer Jacques Piccard in the bathyscaphe Trieste. They spent approximately 20 minutes on the ocean floor before returning to the surface. Now, 52 years later, Cameron’s DEEPSEA CHALLENGER represents breakthroughs in materials science, unique approaches to structural engineering and new ways of imaging through an ultra-small, full ocean depth-rated stereoscopic camera. Cameron’s CAMERON | PACE Group, which supplies 3-D technologies and production support services, has provided the capability to document the historic expedition in high-resolution 3-D. In 1960, an experimental Rolex Deepsea Special watch was attached to the hull of the Trieste and emerged in perfect working order after withstanding the huge pressure exerted at 6.78 miles (nearly 11 km) below the surface. The DEEPSEA CHALLENGER submersible will carry a new experimental wristwatch, the Rolex Deepsea Challenge, strapped to its manipulator arm, renewing the pioneering engineering challenge the Swiss watchmaker took up 52 years ago with the Trieste. The DEEPSEA CHALLENGE expedition will be chronicled for a 3-D feature film on the intensive technological and scientific efforts behind this historic dive. The event will be documented for the National Geographic Channel and National Geographic magazine. Cameron also will collaborate with National Geographic to create broad-based educational outreach materials. This entry was posted on Thursday, March 8th, 2012 at 12:52 pm	and is filed under Film, News. You can follow any responses to this entry through the RSS 2.0 feed. You can skip to the end and leave a response. Pinging is currently not allowed. « Brace Yourself!!! The New ‘Game of Thrones’ Trailer Is Here!!! We'll tie each other to the mast upside down so when the boat flips we'll be the right way up!